Do you crave the peace, calm and beauty greater organization would offer you? And yet, at the same time, dread the process of getting there? Here’s the good news: you’re not alone! For many, the mere thought of letting go creates an almost insurmountable obstacle for getting more organized. 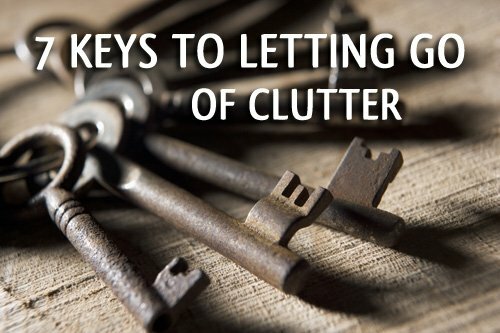 And yet … letting go of excess possessions like supplies, shoes, unused gifts, clothing with the price tags still attached, and incomplete projects, along with letting go of old habits and beliefs about organizing is key to creating a future filled with greater calm, control, and organizational bliss. Connect with the finished result. Why do you want to change or get more organized? How will your space look, feel and function when you’re finished? 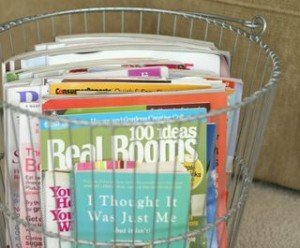 Now, list in vivid detail the benefits you will realize when you are more organized. Don’t forget to write down your answers in complete detail! Do you remember the last time you really dug deep and let go of unwanted and unneeded things? Close your eyes and think for a minute. How did it feel afterward? Did you feel lighter? Did you feel more positive? Did you feel calm and yet energized at the same time? Were you more able to relax? Did you feel more motivated to do things you really love to do? Add everything that comes to mind—all those good and happy feelings—on your handy-dandy worksheet. Decide up front which possessions and activities are priorities in your life—before you ever step foot into the space to be organized. Which belongings in your home are most important to you? Which activities in your life do you want more time or space for? Decide how much is enough. We all have things we love to have plenty of. For some it’s tea. For others it’s t-shirts. For you it may be shoes, scrapbook supplies or purses. For me, it’s magazines. I just can’t seem to get enough! However, for everything you love to love, it’s important to strike a balance between too much and not enough. When you have too much of a good thing you may start to feel bad about the excess or you may even forget what you have. On the other end of the continuum is the point where you feel deprived. Where is your comfort zone on the continuum? How much is enough and how much is too much? For example, before you step into your closet, set a goal. How many t-shirts is enough—ten, twenty or one-hundred? As long as you have the space for it and can find what you need and feel *good* about your answer—that’s what you strive for. Record your decisions on your worksheet. Anticipate and remove your obstacles. Before entering your space of excess—the place you want to whittle down a bit—think about which items will be easy to let go of and which will be a challenge. Add the challenging items to your worksheet along with the reason they’ll be difficult to let go of. The reasons are your obstacles. Now, let’s figure out some simple strategies for removing common obstacles. Obstacle 1: I might need it someday. Strategy: Decide when someday is. Here’s how it works. You come across something and think “I might need this someday.” Ask yourself, “realistically, when will I need this?” If you can’t come up with a definite answer then assign an arbitrary date up to six months out in the future. Put the item in a box, write the date on the outside of the box, and move on. If the “someday” (the date on the box) comes and goes and you haven’t needed the item, you are now free to send it off to a happier place. Ah, doesn’t that feel good? What I’m describing here is the concept of an incubator. I used this concept when organizing kitchen utensils and even when I was decluttering some old car keys. Obstacle 2: I paid good money for this. Strategy: Accept that the money is spent. No amount of hanging-onto an item can bring your money back. Whether you keep it or not, the money is gone. Forever. Cut your losses and move on. If you look at something and feel guilty about what you paid for it, yet you’re not using it, the guilt won’t entice you to use the item. You’ll continue to not use the item and continue to feel guilty about it. Why linger in the yuckiness? Let it go. Obstacle 3: I could make good money selling this. Strategy: Find an alternative happy home for your previously enjoyed items. The “garage sale syndrome” sets in when you have decided to let go of some things and yet they continue to linger in your presence, waiting for the big garage sale. It’s true, garage sales can be a way to turn some of your no longer needed items into cash. But not without a cost. If letting go of things is difficult for you, a garage sale simply extends the process. Instead, find a charity you’ll feel good about donating your items to. Schedule a pick-up for the day after your letting-go session. Or check out www.freecycle.org. In no time, you’ll have treasure hunters lining up to relieve you of your things! Obstacle 4: This was a gift. Strategy: Take the fact that the item was a gift out of the equation. When you come across a gift, ask yourself “Do I need, use or love the item?” It the answer is no, you aren’t obligated to keep the item. A gift doesn’t come with strings attached. I know this one can be hard to swallow… but it’s true. There are ways you can honor the memory of the gift, without actually holding onto the actual item. For example, if you’re a scrapbooker, you could take a photo of the gift and create a mini scrapbook or scrapbook page called “gifts of love.” Record who gave you the gift and for what occasion, and then, why that person is special to you. This will allow you to focus on the person who gave you the gift, and their meaning to you, instead of feeling tied to the gift itself. If you’re faced with a mound of things to go through, it’s easy to become overwhelmed. Look for ways to create visual results quickly. For the things on your list that are easy to let go of, go on a scavenger hunt and collect a box or two full of “don’t-need-it” items and start lightening your load right away. As you go through the process, take note of the positive feelings that come up for you. Add this to your handy-dandy worksheet … and let those positive results fuel more positive results. Energized by your quick and easy results, keep moving in the direction of your goals. Set aside thirty minutes a day for tackling a corner, drawer or shelf. Or block out a couple of hours each Saturday to go through a small space in your home. Little by little you’ll lighten your load and create peace, calm and beauty in your home and life! For a more in-depth discussion on organizing obstacles and how to get around them, join my online class The FUNdamentals of Getting Organized. You’ll get a complete system for organizing your entire home using simple, yet effective, organizing principles. Better yet, you’ll get access to the simplify 101 community forum where you can share your progress and get the support you need—ensuring your success! Im the I might need this someday/ I spend money for this type of person. Need to let go. Thanks for that motivating blog! I love your article! Very helpful!the part about the garage sale someday hits home, and I have deceased parents items too! For years and years!! Thanks for your comments Lorraine and Glenda. Glad you found the article helpful. Wow, this article is so wonderful. I’ve been feeling so overwhelmed with all the junk and clutter filling up my house that I have been putting off doing anything at all. This article is exactly what I needed to help me take the first step into sprucing up my house and my life! I’m looking forward to, piece by piece, removing/organizing the material things and making a cleaner, better home for my furry kids (and me and my husband, too!). Thank you so much! Thank you for helping me to realize my madness,yes ,yes,yes!!!!! I didn’t realize i had accumulated so much,it too me being layed off from my job after X amount of years to move on to the phase of letting go,needless to say,I have so much stuff in my “this can go” packings I can’t believe There was space for it in my apartment,Mounds!! Your article helped me to make the tough call,lord knows I needed to see this. You’re welcome Brenda! I’m so happy to hear this. Good luck letting things go and congrats on your garage sale decision!! Good for you Carrie! Sometimes it can take a while to reach the place where you’re ready to let things go…glad to hear that you’ve reached that point with your sewing supplies. As you declutter, keep in mind how you want your new home to look, feel and function. Then, as you reach difficult decisions, ask yourself if keeping the item moves you closer to your vision for your space, or further away from it. I dont know where to start….. and I cant stop bringing things home because it was free and I can make me some money from it. I am so overwhelmed with things/clutter and dont know where to start. I know that I am neglecting my family from a clean usefull space and I am so stressed everyday just looking at it but I cant find a starting point. How do I let go and where do I start? I’m so sorry you’re feeling overwhelmed. You’re not alone in not knowing where to start. I’ve put together a mini guide to help people get started. I also think it’s important to think about what the clutter is costing you. It’s easy to focus on the money that could be made from free stuff…but if you’re overwhelmed by stuff then that is a real cost to you. Perhaps you could set a limit on the selling…only sell items that you think could bring in $X or more…and donate the rest. Begin creating some space by decluttering items you’re okay selling, and see how your energy begins to shift. Hi there! I so needed this & I’m sure others do, too. So far this year I have managed to declutter my kitchen somewhat. I need lots of help & motivation, though. We are a family of stuff overload! I want to blog about it on my website & include links back to you. If that’s not ok, be sure to let me know. I’m thinking of posting by the end of the month, ‘cuz I’ve got a long way to go! That would be great! We appreciate the link back. Best of luck with your project!! This article will help me. I’m sure I’ll read it seversl times. I’ve always dreamed of having a large home full of antiques, and with room to display my beloved pottery collection. My husband and I have decided on a home smaller than our current one. I almost had an anxiety attack when I realized I would not have room for some heirloom items, plus my collections. I can store a few items for my daughters, but I know it’s crazy to try to keep most of it. What we’re exchanging it for is a life that is less burdened with clutter, cleaning, and moving about. And Less cleaning, more time to relax, and a nicer home for entertaining. Lord help me be strong in the meantime! Thanks so much for your comment. That is a big change you are making, but I think the way you are looking at it – a life that is less burdened with clutter, cleaning and filled with more time to relax and entertain, will make it all worth while! as someone who took 20 years to discover the sheer exhiliration of letting go, my number one recommendation is clear one space and feel the joy! It’s addictive, and motivating to keep going. I did our living room for hubby who always felt tense and cluttered, now its like a holiday space, clear and clean. What I didn’t expect was how much I’d love it too. I went from arguing we didn’t have enough for one garage sale, to making 10 trips to the charity shop plus a massive charity collection at my house. And a happy flow on is I’m now less inclined to bring in new clutter, like a dieter saying no to seconds. Congratulations! Sounds like you’re doing great on your organizing and decluttering journey. Great advice to finish and enjoy one space before moving on to the next. Thanks for sharing that! Genuinely a great article. If you want to add an 8th, give advice for procrastination/anxiety. Thanks for the idea Kara. Here’s a little article I wrote on procrastination. Hope it helps! I love this piece. It has so much good advice. It’s so important to understand the obstacles to letting go of things. That has helped me so much. (And I’m always fascinated to see how different people have different obstacles. Thanks! Thank you, Nancy. So glad you enjoyed the article! I love this post! It’s so hard to really think about WHY it’s important to let go. And what we’re making space for…it’s not about the STUFF! This helps me a lot. I have a issue in each category. I will need to read this article again and again. Please add more encouragement. This article is excellent, probably the best I’ve seen but people like us need a great deal of encouragement. Thank you. Very very good articles. Ramps up our creativity like how items in our home can do many functions. thanks for sharing! I’m cleaning out my closet.. Thank God for everyone out there sharing knowledge to help others grow. My wife shared this with me, I think she might just be hinting that the shed needs a clean up. Thanks for the ideas, I am sure it will help.